You guys know how I love to cook and while summer is still here I’ll take all the garden (or Farmer’s Market) veggies I can get my hands on. This recipe is simple and easy for a busy week and I keep all the ingredients in my house all summer long! Here recently Daarik has been trying new veggies (to him) and I want to just go ahead and thank the high heavens for that!! He loves asparagus, but not the tops which is a double win for me, especially when I make this meal for myself. In a medium skillet add 1 Tbsp. of sesame oil. Chop and add all the veggies (sweet potato first as it may need more time to cook) and cook until they begin to turn tender (20-25 minutes). If there are some vegetables you don’t care for leave them out and add different ones! This recipe is so easy to play around with! I then added my shrimp (and my soy sauce + seasonings), if I didn’t add shrimp I would have added chicken or left all meat out in general and just made the vegetables (I don’t eat beef or pork). 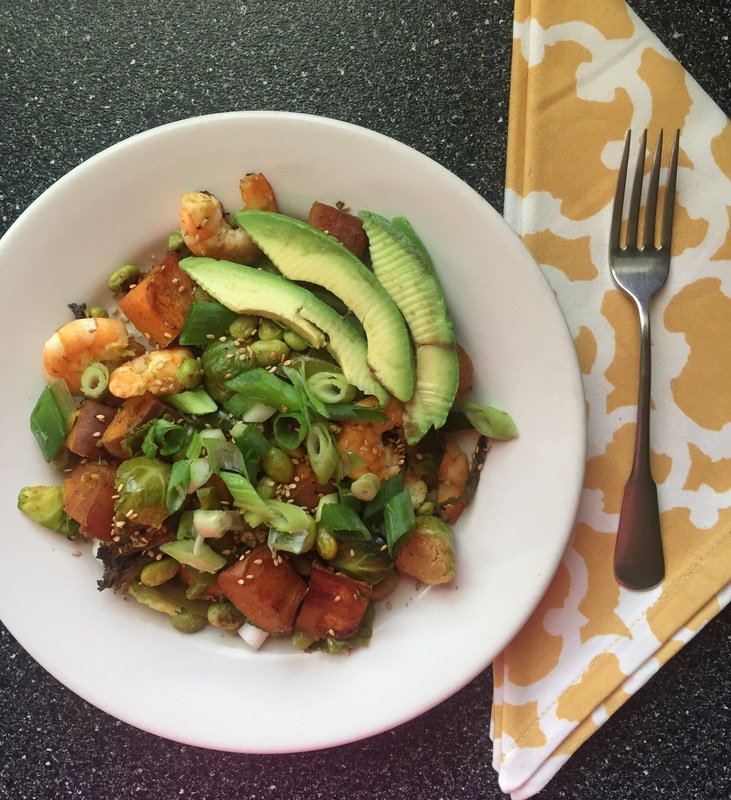 Once the vegetables and shrimp are cooked through, I plated it and topped my meal with chopped green onions and an avocado and sesame seeds! Hope y’all enjoy this as much as I do!